On Tuesday, she was viewed as an ambitious upstart, a charismatic Boston city councilor too antsy to wait her turn in politics but likely to do great things one day. On Wednesday, she was “The Amazing Ayanna Pressley,” the latest political wunderkind to topple an entrenched politician from a seat he has held for nearly two decades. By upsetting conventional wisdom and the best guesses of pollsters — beating Representative Michael E. Capuano 59 percent to 41 percent — she attracted the attention of CNN, the “NBC Nightly News,” and The New York Times, much as New York’s Alexandria Ocasio-Cortez became an overnight sensation by unseating an incumbent congressman weeks ago. Poised to become the first woman of color elected to Massachusetts’ congressional delegation, Pressley was raised in Chicago by her mother while her father, who struggled with drug use, was often incarcerated. She has spoken openly about being the victim of sexual assault. 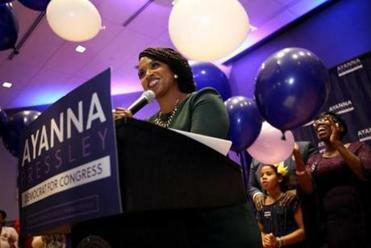 Boston City Councilor Ayanna Pressley defeated Michael Capuano on a promise to help spearhead the fight against President Trump, and to make the Democratic Party more responsive to a diverse constituency. In other years, her background might have invalidated her candidacy. In this political environment, her lived experience was a positive. “She talks in a way that shows me she really understands the systems of oppression that exist in our society in a way Capuano doesn’t,” said Sophie Gildesgame, 25, a voter from Capuano’s hometown of Somerville. Pressley’s was the biggest upset of the Tuesday primary and her appearance was the highlight of the Democrats’ “unity event” — a rally staged the morning after the primary to bring the party’s winners and losers together as a united front for the November election. A conspicuous no-show was Capuano, who had given a brief, very early concession speech the night before. But her aides said he did not talk to Pressley directly — as is traditional before conceding publicly. A Capuano spokeswoman declined to discuss either matter, pointing the Globe to the statements he issued on primary night and on Twitter Wednesday afternoon. Pressley’s win in the Democratic primary virtually ensures she will be the district’s next congressional representative, since no other party launched a candidate and there are no independents on the November ballot. Her victory comes a decade after she was the first woman of color elected to the Boston City Council. Other women of color found similar success in races around Greater Boston on Tuesday. Rachael Rollins became the first black woman to win a primary for district attorney, beating two other women and two men in the Suffolk DA’s race. Liz Miranda surpassed three male candidates in the race for the state House of Representatives’ Fifth Suffolk District. And in another upset, Nika Elugardo beat incumbent state Representative Jeffrey Sánchez in the 15th Suffolk District. Bookman, who volunteered to drive voters to the polls on Tuesday for Pressley, said those she met were excited by her candidacy, feeling a certain kinship. “Many of them were just so excited that somebody like Ayanna — who they feel understands their lives — is running,” Bookman said. Still, Bookman is careful not to overstate the rate of progress for women in politics — particularly women of color, noting how few hold office. According to data from the Associated Press, Pressley won much of the Seventh Congressional District, which includes portions of Boston, Cambridge, Chelsea, Everett, Milton, Randolph, and Somerville. Boston, which Pressley has represented on the City Council since 2009, rewarded her broadly. The parts of the city in the congressional district supported her with 64 percent of the vote to Capuano’s 36 percent. In Capuano’s native Somerville — a city he previously governed as mayor — Capuano only eked out a win, beating Pressley 50.4 percent to 49.6 percent, the data show. Attorney General Maura T. Healey, one of the few prominent Democratic politicians who had broken ranks with the incumbent to endorse Pressley, introduced her with the “amazing” tagline on Wednesday, and said she “was not the least bit surprised,” by her win, having seen Pressley’s impact on the community. “At her core, she is a person of tremendous integrity, tremendous conviction, and tremendous empathy,” she said. Pressley’s day of victory was not without its difficulties. After leaving the stage and the Democrats’ event early, Pressley canceled a scheduled public appearance in the afternoon. Her campaign manager, Sarah Groh, cited dehydration and exhaustion, after a few intense days on the trail. But Pressley had already alluded to her condition, explaining to her fellow Democrats her unusually tamped-down demeanor.